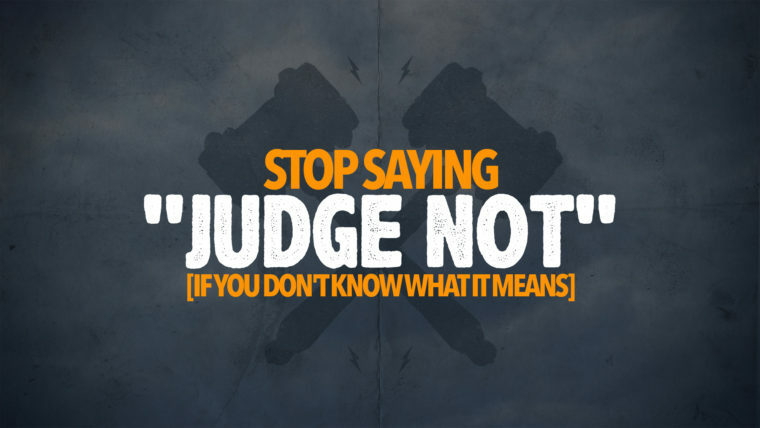 Why Christians Should Judge Others. We live in a culture that no longer sees its sinfulness but is saturated by relativism and tolerance. It wasn’t that long ago that you would attend a sporting event, and someone had a John 3:16 sign they would hold up for the camera. It wasn’t long ago that nearly every child in America knew one verse by heart, John 3:16. Matthew 7:1 has replaced John 3:16 in our nation’s life and practice, particularly in personal and social media conversations. Judgment is out tolerance and love are in. If “Judge not lest ye be judged” was an issue in the 20th century than it has become a monster in the 21st century. What Christ is proclaiming in his sermon is not the absence of conviction for the sake of unity. He is challenging the type of judgments we make and the motivation behind those judgments. We are to examine our doctrine and the doctrine of others (1Tim. 4:16) while avoiding making final judgments of others because the authority to do so belongs to God alone. Our manor of judgment should be with the awareness of our need of saving, empowering and enabling grace which produces humility in our approach toward others. In examining ourselves first, we remove the plank from our eyes so we can become better speck removers. The manner of our judgments must be based on principles rather than prejudices. Lloyd-Jones again hits the nail on the head. “Another manifestation of this (self-righteous) spirit is that it puts prejudice in the place of principle. We are to judge in terms of principle because otherwise, we cannot disciple the Church. We are to judge in terms of principle because otherwise, we cannot disciple the Church. But if a man takes his own prejudices and puts them up as principles, he is guilty of this spirit of judgement. Never has there been such a need for proper judgment of doctrine and practice inside and outside the church pitted against the intolerance to any claim of truth. We must make our judgments based on principles of truth, not prejudices or personalities. In this climate, we must take risks to judge, but we must judge in the right way with the right motivation.